software satisfaction, and areas for software improvement. develop your custom model in PHDWin. write a customized report template. convert your database to PHDWin. Calculate sophisticated domestic and international economic models in real time. 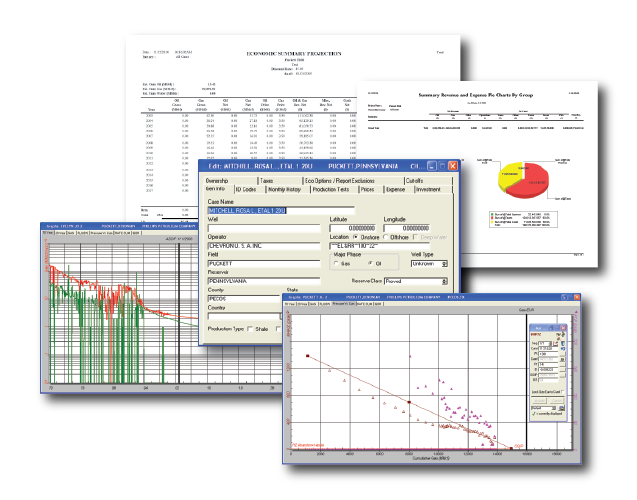 Flexible forecasting methods meet intuitive interface with PHDWin’s graphing module. Companies need to know how much they have already produced, how much is left to produce, and the total estimated economic recovery. Easily view the economic impact associated with a change in economic parameters. Choose from one of 60 default report formats that come standard with the program. Roll-ups and summaries are easy to define and automate. Create unlimited PHDWin projects and share data with ease. Our .phz transfer file provides full transparency of all economic inputs and results. PHDWin is by far the easiest software for my team to learn. I can have someone that understands reserves an economics up and running on PHDWin within an hour, unlike other products that takes months to establish a basic working efficiency. It’s the only software that can be used out of the box. PHDWin is the rare Reserves and Economics program that a person can pick up on his own and begin using productively in less than a day; yet has all the features to handle the unique situations. At Continental Resources, we continue to be very pleased with the speed, accuracy, and consistency of the PHDWin product. Having generated reserve reports for the last 3 years with this product, we have always been able to model any economic criteria necessary to determine the value of our assets. PHDWin has been user friendly and simple; yet sophisticated enough to handle complex economic evaluations. Data importing and exporting along with merging files has been straight forward. Offshore evaluations were always cumbersome before PHDWin because the platform economic limit had to be calculated by hand. Now, PHDWin makes it easy for us, we just assign wells to a platform case and PHDWin takes care of shutting-in and abandoning the wells and the platform when the whole thing is at its economic limit. Being in the consulting business, we have been exposed to virtually all commercially available evaluation software. PHDWin has separated itself from the competition by providing a powerful, user-friendly product that meets both our client’s needs and our own needs at a reasonable cost. They have been very responsive in providing additional program utilities to manage our more sophisticated evaluations as well as providing technical support that is both knowledgeable and accessible. In our opinion, PHDWin is the best overall economics package on the market.